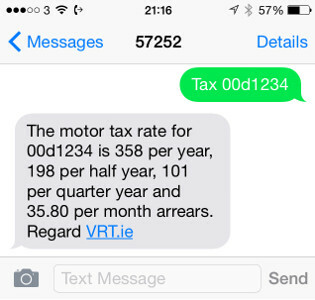 All you have to do is send us a text with the reg number as described below and you will receive a text with an estimate of your VRT or motor tax. We supply motor tax rates for any vehicle. We supply VRT estimates for cars and it may not be possible to receive an estimate for some rare cars such as maserati’s, ferrari’s etc.